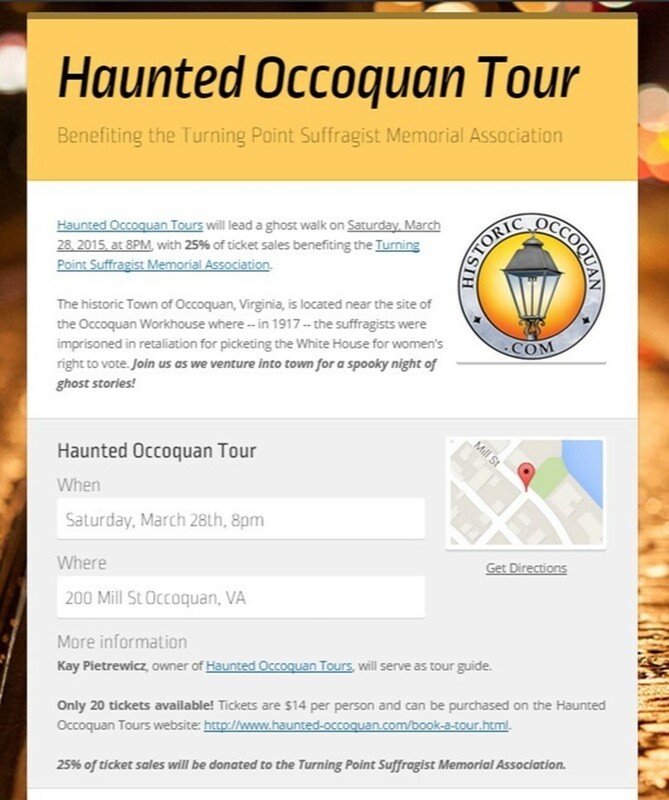 Haunted Occoquan Tours will lead a ghost walk on Saturday, March 28, 2015, at 8PM, with 25% of ticket sales benefiting the Turning Point Suffragist Memorial Association. The historic Town of Occoquan, Virginia, is located near the site of the Occoquan Workhouse where — in 1917 — the suffragists were imprisoned in retaliation for picketing the White House for women’s right to vote. Join us as we venture into town for a spooky night of ghost stories! Only 20 tickets are available! Tickets are $14 per person and can be purchased on the Haunted Occoquan Tours website: http://www.haunted-occoquan.com/book-a-tour.html.